2018 Newest Premium High Performance RCA Galileo 11.5" 2-in-1 Touchscreen Tablet PC Intel Quad-Core Processor 1GB RAM 32GB Hard Drive Webcam Wifi Bluetooth Android 6.0-Black | Replicafer Co.
11.5-inch high definition screen. The impressive 1.3GHz quad-core processor is powerful enough to zoom through applications and tasks. Quickly update your social statuses, compose emails and navigate the Web with the detachable keyboard and built-in trackpad. 32GB of storage memory When it's time to get down to business, open up the included WPS Office app and create powerful documents and spreadsheets. 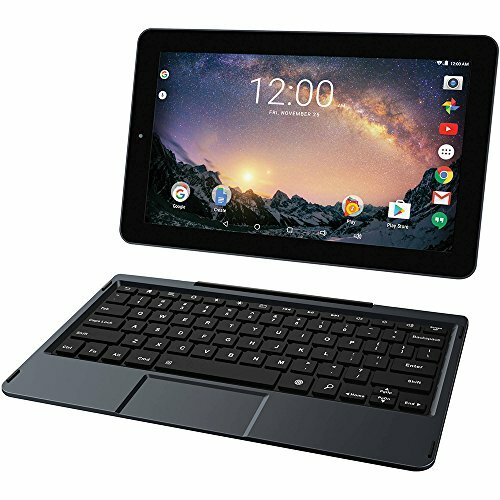 Effortlessly transition the RCA 11 Galileo Pro into a stand-alone tablet by detaching the keyboard. Webcams, WiFi and Bluetooth You may also dock the tablet to the keyboard in many positions to suit your liking or intended use. Use the tablet's Bluetooth functionality to pair and connect with other Bluetooth-enabled devices.